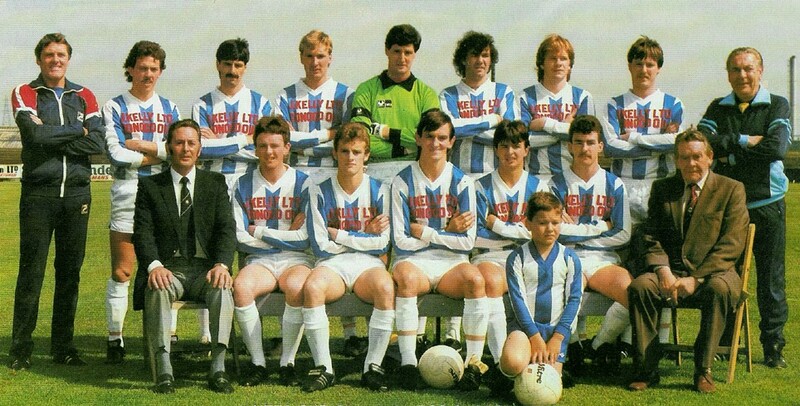 Tony Curley’s decision to step down at the end of the 1983/84 season saw Coleraine once again looking to appoint a new manager. The previous five bosses had all been players or held coaching posts within the club when handed the reins but in a departure from their recent tradition, the board brought in someone from outside the club for the first time since Bertie Peacock’s appointment in 1961. The man in question was Northern Ireland international goalkeeper Jim Platt, who having returned home after a lengthy playing career with Middlesbrough had taken up the reins at Ballymena United midway through the 1983/84 campaign and had ended it by winning the Irish Cup. Platt had played for Coleraine Rangers in the sixties but with Eric McManus and Eddie Crossan competing for the number one shirt against Victor Hunter and Eddie McAfee, he opted to join Ballymena United, from whom he moved to Middlesbrough. Despite his success at Ballymena, Platt couldn’t turn down the opportunity to play for and manage his hometown club. In moving to Coleraine, he kept up a proud family tradition, following in the footsteps of his brothers John and Davy and his father Howard. However, the arrival of Platt meant the end for one Showgrounds stalwart, Vincent Magee’s long association with the club coming to an end as the new manager would be expected to take over the number one jersey. 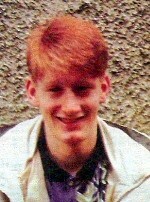 However, before he could make his debut for the club, a slightly bizarre situation arose as Platt was still registered as a player at Ballymena and the two clubs were unable to agree a fee and as fate would have it, Coleraine were drawn to face Ballymena in their opening match of the season. Coleraine won the game with 18-year-old reserve David Crooks playing in goals, but it was until the middle of September before Platt was to finally make his bow in a Coleraine shirt. Aside from himself, some of Platt’s earliest signings included winger Paul McGurnaghan from Chimney Corner and forward Barry McCreadie, brother of Roy, from Derry City. Platt’s side reached the Ulster Cup semi-finals, losing to Linfield, but didn’t make it out of their Gold Cup section, but after suffering a home reverse to Glenavon on the opening weekend of the league in November, embarked on an 11 match unbeaten run. Twice inside a month, they hit six goals, winning 6-2 at Bangor and 6-0 against Crusaders at Seaview. Goals from Roy McCreadie and Ricky Wade secured a 2-1 win over champions Linfield at Windsor Park in December sending out a message that Coleraine were real title contenders. Wins against Chimney Corner, RUC and Glenavon in the Irish Cup saw Coleraine enter the final month of the campaign with their eyes on the league and cup double but successive defeats, to Glentoran in the cup semi-final and to Linfield in the league, dented momentum. Coleraine responded well, defeating Ards, Ballymena and Carrick and drawing with Glentoran, but ultimately ended up second in the table, three points behind Linfield after losing to Cliftonville and drawing with Distillery in their last two games. Platt refined his squad during the close-season in preparation for another tilt at honours, bringing in left back Dessie Edgar and new forwards Davy Richardson and Alan Campbell (son of the stalwart defender of the same name), who went on to net nearly 50 goals between them that season, to add to the talent already present. In traditional fashion, the season began with the Ulster Cup and Coleraine were in excellent form. They topped their first round section after a thrilling 4-3 win over Crusaders and then defeated Dundela and Cliftonville to book their place in the final. Their opponents in the showpiece were Portadown and it was a quite extraordinary contest. Deadlocked at 0-0 after 90 minutes, Coleraine went to town on their opponents in extra time, hitting five unanswered goals. Felix Healy helped himself to four, two of which were penalties, and Davy Richardson got the other to hand Platt his first trophy as Coleraine manager and end a 10-year wait for one of the local game’s four major prizes to arrive at The Showgrounds. Either side of the Ulster Cup triumph, Coleraine renewed acquaintances with old foes Lokomotiv Leipzig in the UEFA Cup. Ricky Wade scored the goal which gave Coleraine a 1-1 draw in the home leg, but there was to be no repeat of their heroics from their previous visit to East Germany in the return, as Leipzig ran out 5-0 victors. A marathon 14-match Gold Cup campaign ended with a semi-final defeat to Linfield and then Coleraine made an inconsistent start to the league, effectively ending their chances of another tilt at the title. They didn’t really click into gear in the league until March, winning seven and drawing three of their last ten games to finish second once again, but by the final weeks of the season all their hopes of silverware rested on the Irish Cup. The campaign had started in February with a 2-0 win over Linfield at Windsor Park, Davy Richardson and Felix Healy on target, followed by a 2-1 home win over Ballymena thanks to goals from Wade and Healy again. Sammy McQuiston (2), Richardson and Eddie McElhinney ensured the B Division’s Chimney Corner were no obstacle in the third round and Wade and Healy netted in the semi-final against Ards to book Coleraine’s place in another final. Glentoran were their opponents in the showpiece and went in front through Gerry Mullan, before Healy equalised from the penalty spot. As the seconds ticked away, it looked certain that the two sides would be back at Windsor Park for a replay. But then, completely out of the blue, Glens sub Paul Millar launched a speculative effort goalwards which completely caught Platt unawares and he was left grasping at thin air as the ball sailed over his head and into the net. Practically the last kick of the final, it was a cruel way to lose. 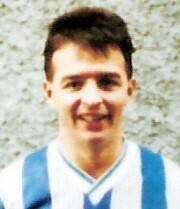 The end of the 1985/86 season saw long-serving Tony Hutton depart The Showgrounds. He was the last player remaining from the team which lifted the Gibson Cup in 1974 and had been granted a testimonial earlier that season against Derry. 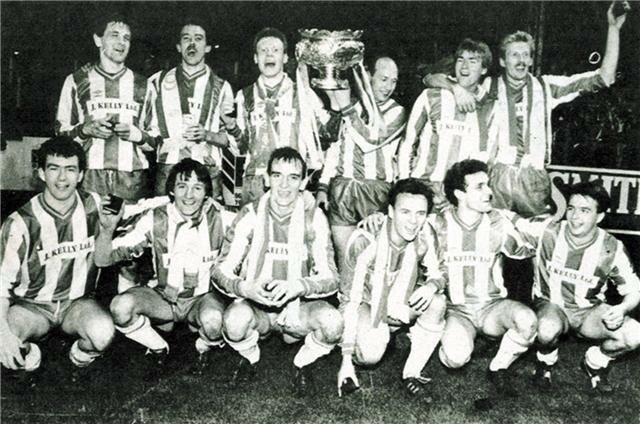 1986/87 saw Coleraine start off by defending their Ulster Cup crown. After safely negotiating their first round group, they gained a little bit of revenge for that cup final defeat by beating Glentoran 3-0 at The Showgrounds in the quarter-finals. A penalty shootout win over Larne in the semi-final set up a final against Linfield at Windsor Park and Coleraine emerged triumphant once again, Ricky Wade scoring the only goal of the final. There was another brave performance in Europe that year as they once again faced East German opposition. Felix Healy earned Coleraine a 1-1 draw from the home leg against Stahl Brandenburg and they only went down 1-0 in the return, running their hosts very close on the night. Despite their Ulster Cup and European heroics, their start to the league campaign was nothing short of a disaster. For a side harbouring serious title ambitions, one point from the first four matches was a seriously poor return and although Crusaders were hit for six at The Showgrounds in the fifth game, this was immediately followed by another four match winless streak, leaving Coleraine in the lower reaches of the table as the halfway point approached. But then, starting with a 5-1 win over Bangor on November 1, Coleraine hit form. In the remaining 17 matches, Coleraine won 15 times and drew twice to end up second behind Linfield for the third successive year and without the disastrous start, the Gibson Cup would surely have been sitting in the Showgrounds’ trophy cabinet. With the league done and dusted in February, the season ended with a number of cup competitions and there was more disappointment in store. Coleraine’s league form deserted them in the Gold Cup, while chances of a second successive Irish Cup final appearance were ended in the semi-final by Larne. The season then ended on a low note as Linfield eliminated Coleraine from the new Irish League Cup. Despite a lack of success for the team in the second half of the campaign, it was a fine campaign on a personal level for Ray McCoy, who finished with 21 goals and was a double award winner, picking up the Ulster Footballer of the Year trophy and the NI PFA Player of the Year award. He also won his one international cap, coming on as a sub in Northern Ireland’s 2-1 defeat by Yugoslavia. It would be the last time for 22 years that a Coleraine player would represent their country at senior level. 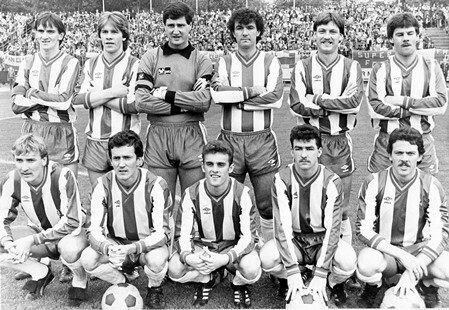 The summer of 1987 saw Felix Healy depart Coleraine for Derry City, who were now playing in the League of Ireland, while Roy McCreadie joined Portadown. The 1987/88 season began with Coleraine looking to seal a third successive Ulster Cup and after safely negotiating encounters with Linfield and Glentoran in the quarter-finals and semi-finals; they were strong favourites to defeat Larne in the final. But a team missing Ray McCoy and Marty Tabb went down to a 2-1 defeat, the unfortunate Nigel Quigley heading an own goal past Platt to give Larne the win. The autumn of 1987 brought another UEFA Cup campaign and the visit of Dundee United to The Showgrounds was the first game played u nder the newly installed floodlights. Coleraine lost 1-0 on the night and then 3-1 in the return leg at Tannadice, but were not disgraced against a side which had gone all the way to the final of the competition the previous season. After the disappointment of failing to hold onto their Ulster Cup crown, the Roadferry League Cup proved a more successful competition for Coleraine. Queen’s University were brushed aside 6-0 in the first round, while Carrick were dismissed with minimum fuss in the second. Penalty shootouts were needed to get past Ards and Linfield in the quarter-finals and semi-finals respectively, setting up a final against Portadown at The Oval. With regular number nine Barry McCreadie ruled out through injury, Platt handed veteran Sammy McQuiston his first start of the season and he repaid his manager’s faith in him deep into extra time, poking in the rebound after Mickey Keenan had parried his initial shot. Coleraine then reached the final of the Budweiser Cup just under a month later, but were defeated 1-0 by Glentoran, who also eliminated them at the first hurdle in the Irish Cup later that season. After finishing runners-up three years in succession, Coleraine again mounted a strong challenge for the title, but couldn’t keep pace with the Belfast ‘big two’ in the league and ended up third, missing out on a place in Europe. A win in the revived North West Cup, against Oxford United Stars at least saw some more silverware arrive before the end of the campaign. 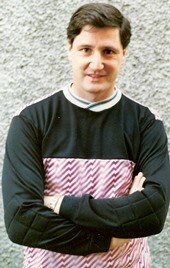 Despite the signing of Glentoran’s former international Gerry Mullan in the summer of 1988, the North West Cup would be all Coleraine fans had to celebrate the following season too, semi-final defeats in the Ulster Cup and Budweiser Cup being the closest they came to any major silverware and coming in third in the league again as Linfield and Glentoran streaked clear at the top. The 1989/90 season started brightly in the Ulster Cup, until progress was brought to a halt by a 4-0 hammering at the hands of Glentoran in the last four. There was little joy for Coleraine in the other early season competitions and despite continued good displays from stalwarts such as Wade, McCoy and Tabb, it was clear from results that Platt’s Coleraine were not as strong as they had been in recent seasons, despite featuring a number of promising young players in the ranks, one being Steve Lomas, who made his debut aged just 15. Coleraine were never in the hunt for the league title, but this time struggled to even keep themselves in a comfortable mid-table position. They did reach the Irish Cup semi-finals but were outclassed 4-0 by eventual league champions Portadown and the league campaign ended on a low note with seven straight defeats, leaving Coleraine 11th their worst finish in 30 years. To add insult to injury, they didn’t even pick up the North West Cup, losing 1-0 in the final to Tobermore United. Under heavy pressure following the Portadown defeat, Platt handed in his resignation, leaving reserves boss Frankie Moffatt to take temporary charge in the final four games of the season, all of which ended in defeat. Although Platt’s time in charge ended on a low note, he had brought more silverware to Coleraine than any manager other than Bertie Peacock and with one of the most entertaining sides in the club’s history, had come very close to winning that elusive second league title.